Will To Live Founder, John Trautwein Blog’s about his “best day” with his son Will – What John had no idea was that Will was struggling and suffering from depression – and 5 days later, to his father’s, his family’s and his community’s shock, Will Trautwein took his own life. As these early “days after” continued, I was often asked about Will’s demeanor during the days and weeks leading up to his death. My response was always the same: “He seemed fine.” I was haunted, however, by a good memory that I had with him only a week before he died. In some ways, I consider it one of the most wonderful, and at the same time, the most disturbing memory of Will and me together. I now refer to it as 10-10-10. October 10, 2010, just five days before he died, was a Sunday, a wonderful Sunday that I will remember the rest of my life. Will had a lacrosse game in Milton, about thirty minutes away, and Susie and I decided I’d drive him while she stayed with the other kids. It was not a very exciting game, and he really didn’t do too much. He didn’t get the ball very often at all. These games were only two twenty- minute halves with a running clock, so before I knew it, the game was over and basically nothing happened. I don’t believe Will had any shots on goal or any special plays that stood out. Thus, it was a kind of nondescript outing. It would turn out to be his last time playing the sport he loved so much. “Dad, can we go to KFC on the way home?” There was excitement in his voice, and I thought, Good, he’s forgotten about the game already. “Oh yeah,” was his response in his very cocky way. The same way he would answer when I would ask him if the girls were after him: “Oh yeah, all the time!” I loved when he did that. He was basically imitating me (as far as I was concerned), trying to be cool and cocky, and it made me laugh. From the time we got in the car in the parking lot of the lacrosse game, through the drive-through at KFC, and up until arriving at our home, I had the fabulous good fortune of being able to spend about forty-five truly quality minutes with my son. We talked; we simply talked. It was probably the best conversation I ever had with him, which is a rather big statement when I think of it. Will wanted to go to Northwestern mainly because he had experienced a pure brainwashing from his dad, going back as long as he could remember. The brainwashing, however, was effective in that he saw how much I loved my college experience, and he heard and witnessed the stories and conversations I still had with my Northwestern buddies and teammates. Will was able to recognize how special that was. As I turned into the KFC drive-through, I mentioned that I would check in with my buddy Paul Stevens, the head baseball coach, and see what he knew. “Will, really?” I responded immediately. “You’re already better than the instructors. It would be a waste, don’t you think?” I could not understand him needing to take guitar lessons; he was truly awesome at it. “Will, I think you should take piano. To me that’s the instrument where all music comes from, and if you can play that, well, it’s the basis of all others.” Of course, I didn’t really know what I was talking about, but I believed that statement and said it confidently. “Really? Dad, that’s awesome! When can we sign up?” He was genuinely excited, and his eyes were twinkling. “Let’s sign up this week Will.” I truly meant to sign him up that week, but life got in the way, and I didn’t do it. Another what-if that I’ll never get over. I was really enjoying this conversation, but it would get even better. Will normally didn’t have that much to say to me. I would be the one asking the questions and dominating the conversations because his answers were typically yes or no monosyllabic grunts. Today, though, he was genuinely interested in talking with me. It was awesome, and I recognized the moment as something special. “I don’t know either, Will.” I was brainstorming now; how could I help him with this? I loved this conversation. We were talking about what he would study in college. Wow. “Okay, cool. I will.” He was thinking now. I could see the wheels spinning, and what was really fun for me to see was the excitement Will seemed to have in just having a plan. Will was creating a plan to see what it would take for him to follow his dream of studying music. I could see this brought him not only comfort but excitement. He had a slight smile across his face; perhaps it was satisfaction that he knew what he wanted to do and was beginning to do something about it. I felt like he was enjoying the moment. I knew that I certainly was. We were now getting close to home, and I really did not want this ride to end. I continued our dialogue. I then said something to Will that I did not plan to say. I’m so glad I did say it, but I must admit, thinking about it brings a certain sadness to my heart – as if I was too late – I’ll never know. “Man, Will,” I said as I stopped the car at a stoplight and intently looked into his eyes, “I would do anything to change places with you right now.” I had his complete attention. He looked me right in the eyes. “Because you can have it all, buddy. You have so much going for you, and you’re about to embark on the most fun part of your life. You have so much fun ahead of you, Will, and I’m so excited about that.” I truly believed every word I said, and he could see it in my eyes, I know he could. Will smiled at me and then turned and looked out the window. He was smiling, and it looked to me like he was really thinking about what I said. We pulled into the neighborhood and I stopped the car again. He turned and looked at me, confused. He had a huge smile, and his eyes had such a twinkle when he smiled. At that moment I noticed how handsome he was. I thought, Man, this was a great day—perhaps my best ever with him. It was all I could think about. I was so happy. For some reason, I thought, I can’t wait to talk to my dad about this experience with Will. We got out of the car, walked around the front end, and high-fived as we passed. We both were laughing. Will drove home perfectly, while I watched him from the passenger seat. I was happy. I was thankful. Yep, October 10, 2010—10-10-10—was perhaps my best day with Will. The day I thought he was really looking forward to his own future, and he was sharing it with his dad. 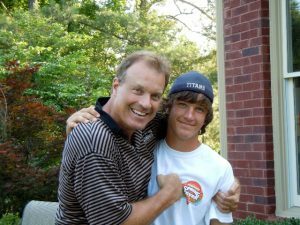 If anyone would have told me that five days later I’d be calling my mom and dad to tell them my boy had taken his own life … If anyone had said, “I’m worried about Will,” if anyone had said, “Hey, there’s a teen suicide or teen mental health awareness seminar going on,” I would have ignored them. My kids are good—my Will is good— we’re good. We’re the Trauts, and life is good for the Trauts, just like it’s always been. When I read those words in the weeks after his death, I sat back in my chair and smiled. Wow, Will was really listening to me that day. As time went on, we heard more and more stories from Will’s friends and their families telling us things that Will said, or did, that reflected the “teachings and philosophies” of Susie or me. Our kids are listening; they are watching us all the time. So was it me who was not listening? Was it me who was not watching? Forgive me, Will, forgive me. Maybe I was so worried about whether you were listening to me that I really didn’t listen to you. ← WTL Bow Tie In The World Series!